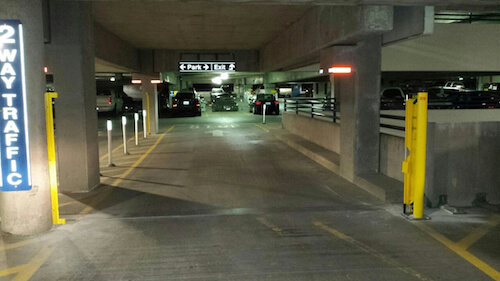 Need to close a parking deck level . . .
Change from access to no access, quickly. RAMP-BLOCKER™ is easy to extend/easy to retract by one person. 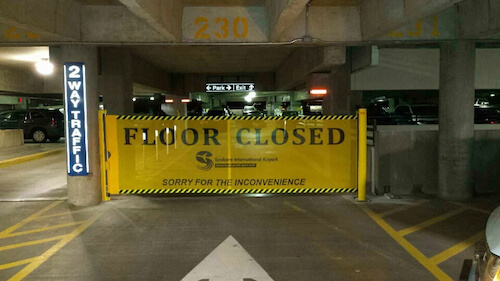 Installing RAMP-BLOCKER™ at some entrances will allow you to close off access as needed. Can be used inside or outside. Four anchor bolts secure RAMP-BLOCKER™. Two or four bolts anchor the Receiving Hook, choose from 6 styles. Style 7 Bollard Mount Bracket attaches barrier spring housing to existing bollard. Barriers 12′ Long are standard, but are available longer. RAMP-BLOCKER™ spring housing is steel reinforced HDPE extruded safety yellow. Panel is Air-thru (no walk thru) mesh 48″ hi w/8″ sweep. Hi-vis hash/slash ribbon top/bottom both sides.